Megan Rapinoe scored her fifth goal of the season as Seattle Reign FC beat Sky Blue FC 1-0 on Saturday night. The fifth win of the season for the Reign came in front of a crowd of 2,814 at Yurcak Field in Piscataway, New Jersey. Sky Blue FC dropped to 0-7-1 (1 point) and are still looking for their first win of the season. The Reign improved to 5-2-2 (17 points) and jumped back into the No. 2 spot in the NWSL standings. Rapinoe’s goal came in the 64th minute. Christen Westphal sent a cross towards the penalty spot and Rapinoe was open to tap it with her right foot for the goal. It’s her fifth goal of the season, second only to Christine Sinclair‘s six for the league-lead. The Reign nearly doubled the lead in the 80th minute, but Sky Blue FC’s defense came up big. First, goalkeeper Kailen Sheridan saved Rapinoe’s shot, and then defender Rebekah Stott made a goal line clearance in front of an onrushing Jasmyne Spencer to keep the ball out of the back of the net. Both teams came into the game after midweek losses and on a stretch of three games in eight days. Sky Blue FC held a slight edge in possession over the Reign (51.8% to 48.2%) and in total shots (10-9). The Reign tallied more shots on target, however (6-4). Reign defender Steph Catley missed the game with a left ankle contusion. Sky Blue FC are now winless through their first eight games of the season, second to the 2013 Reign who went winless through their first 11. They’ll try again for their first win on Saturday, June 2, at home vs. Utah Royals FC. The Reign will host the Orlando Pride on Sunday, June 3. Attempt missed. 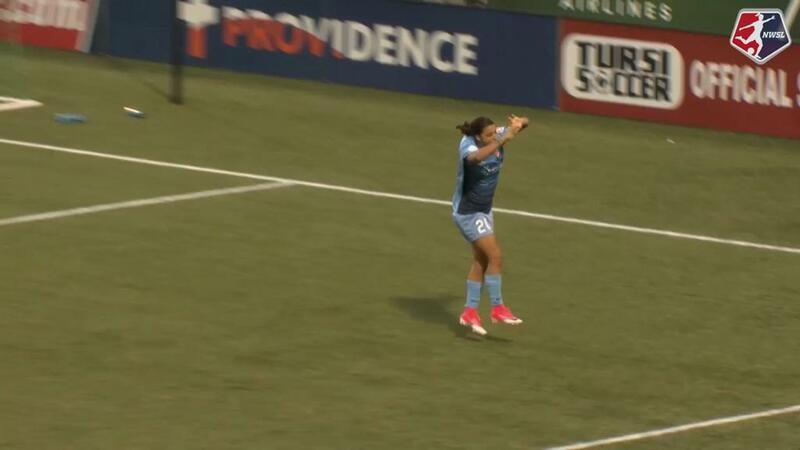 Carli Lloyd (Sky Blue) header from the right side of the box misses to the left. Assisted by Savannah McCaskill with a cross. Substitution, Sky Blue. Madison Tiernan replaces Thaisa. Substitution, Seattle Reign. Alyssa Kleiner replaces Elizabeth Addo. Attempt saved. Megan Rapinoe (Seattle Reign) right footed shot from the centre of the box is saved in the centre of the goal. Assisted by Beverly Yanez with a through ball. Attempt saved. Savannah McCaskill (Sky Blue) right footed shot from the centre of the box is saved in the bottom left corner. Assisted by Shea Groom with a cross. Attempt missed. Amanda Frisbie (Sky Blue) left footed shot from outside the box misses to the right. Assisted by Sarah Killion following a corner. Corner, Seattle Reign. Conceded by Savannah McCaskill. Goal! Sky Blue 0, Seattle Reign 1. Megan Rapinoe (Seattle Reign) right footed shot from the centre of the box to the centre of the goal. Assisted by Christen Westphal. Substitution, Sky Blue. Shea Groom replaces Katie Johnson. Attempt saved. Megan Rapinoe (Seattle Reign) right footed shot from outside the box is saved in the bottom left corner. Assisted by Christen Westphal. Attempt blocked. Thaisa (Sky Blue) right footed shot from outside the box is blocked. Attempt missed. Katie Johnson (Sky Blue) right footed shot from a difficult angle and long range on the right is high and wide to the right. Assisted by Kailen Sheridan. Attempt blocked. Savannah McCaskill (Sky Blue) right footed shot from a difficult angle on the right is blocked. Assisted by Janine Beckie. Attempt saved. Megan Rapinoe (Seattle Reign) right footed shot from outside the box is saved in the bottom right corner. Corner, Sky Blue. Conceded by Theresa Nielsen. Thaisa (Sky Blue) wins a free kick in the attacking half. Attempt missed. Savannah McCaskill (Sky Blue) right footed shot from outside the box misses to the left. Assisted by Janine Beckie. Attempt missed. Thaisa (Sky Blue) header from the centre of the box misses to the left. Assisted by Sarah Killion with a cross following a corner. Attempt saved. Janine Beckie (Sky Blue) right footed shot from a difficult angle on the left is saved in the bottom left corner. Assisted by Sarah Killion with a cross. Delay in match Lydia Williams (Seattle Reign) because of an injury. Offside, Seattle Reign. 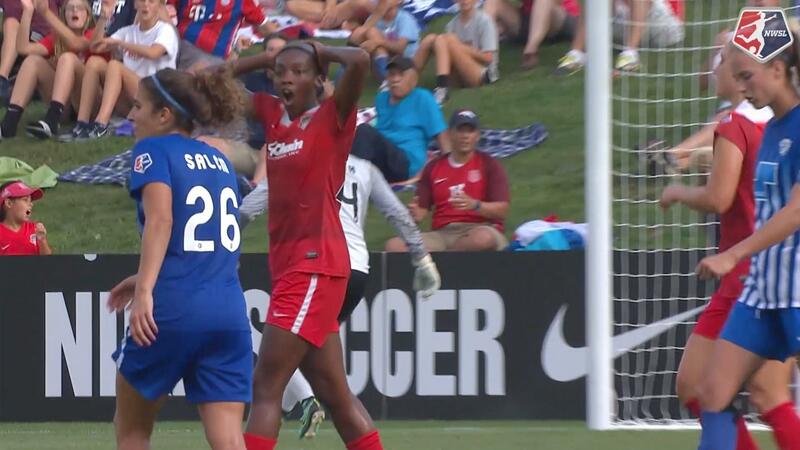 Megan Rapinoe tries a through ball, but Elizabeth Addo is caught offside. Elizabeth Addo (Seattle Reign) wins a free kick on the right wing. Attempt missed. Megan Rapinoe (Seattle Reign) right footed shot from outside the box is too high. Assisted by Jessica Fishlock. Corner, Seattle Reign. Conceded by Rebekah Stott. Attempt saved. Megan Rapinoe (Seattle Reign) right footed shot from outside the box is saved in the centre of the goal. Assisted by Rumi Utsugi. Attempt saved. Jessica Fishlock (Seattle Reign) right footed shot from the centre of the box is saved in the bottom right corner. Assisted by Elizabeth Addo. Attempt missed. Megan Rapinoe (Seattle Reign) right footed shot from outside the box misses to the left. Assisted by Jessica Fishlock. Attempt saved. 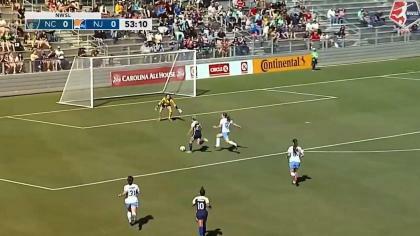 Carli Lloyd (Sky Blue) left footed shot from the left side of the box is saved in the bottom left corner. Assisted by Amanda Frisbie. Thaisa (Sky Blue) wins a free kick in the defensive half.